The Wicklow Way is Ireland’s oldest waymarked walking trail and is enjoyed by many independent walkers every year. J.B. Malone pioneered this hiking trail over 40 years ago. It reveals some of Ireland’s finest views including Powerscourt Waterfall, Luggala, Loch Dan, Glenmalure and historical Glendalough. The Wicklow Way walking and hiking trail extends from Marlay Park in Dublin to Clonegal on the borders of Wicklow and Carlow, covering a distance of 127 kilometres (79 miles). At Footfalls, we offer a variety of holiday packages on the Wicklow Way, to cater for all types of outdoor and fitness enthusiasts. 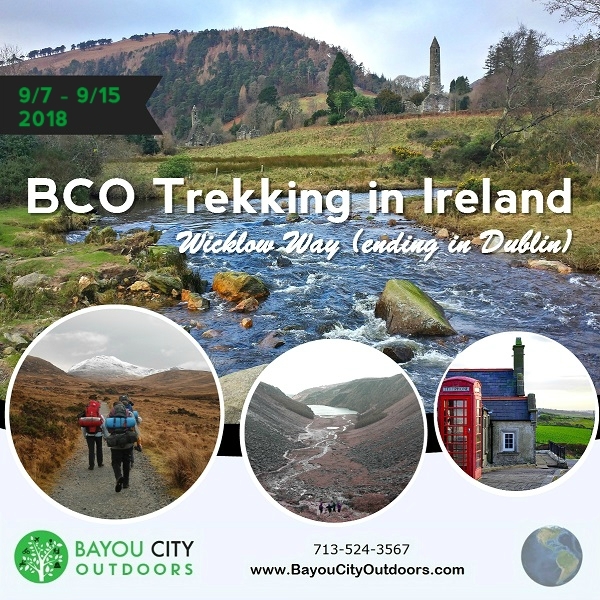 This, easy to moderate, six-day walking holiday along the Wicklow Way towards Dublin will take you over 60km along the stunning beauty of the Garden of Ireland. Arrive at Dublin Airport and take the train to Rathdrum. Stay first night in Rathdrum in nearby bed and breakfast accommodation. Your first day of walking along the Wicklow Way takes you steadily up out of Glenmalure Valley. As you climb, the beauty of the surrounding countryside and the famous Glenmalure Waterfall will simply take your breath away! The trail crosses the side of Mullacor Mountain and continues into the valley of Glendalough “Gleann Dá Locha” the valley of two lakes. 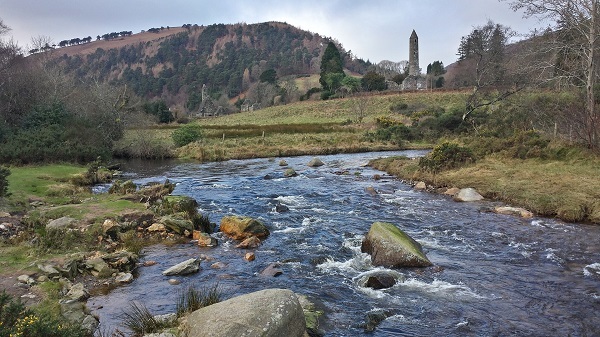 Glendalough. Which is one of the most visited sites in Ireland, is famous for its 6th Century Monastic Settlement and also mesmerising in its beauty! Stay overnight in Laragh. Distance: 14 km / 8 miles. Ascent: 450 m / 1350 ft. Approximate walking time: 4 hours. Today's walk, although shorter, is a very rewarding one, taking in some fantastic scenery and finishing in the highest village in Ireland, Roundwood at 260m/780ft. You will pass very close to our Footfalls office which is just outside the village of Laragh. At this stage, you have the option to extend your self-guided walk by taking in Scarr Mountain or instead enjoying a less strenuous walk around one of the Roundwood Reservoirs, which supplies water to part of Dublin city. Tonight you will stay in Roundwood. Distance: 12 km / 7.5 miles. Ascent: 250 m / 750 ft. Approximate walking time: 3.5 hours. This is a classic walk taking in views of Lough Dan and Lough Tay. It was in this area where many famous movies were filmed, including Brave Heart, King Arthur, Dancing at Lughnasa and much more. This is also the original home of the Guinness Family and their residence is still to be seen at the top of the valley. You will hike over the side of Djouce Mountain and alongside the Powerscourt Estate, where you will have some fantastic views over Powerscourt Waterfall, Ireland’s longest waterfall. Your second last night in Wicklow is spent in one of Wicklow’s most charming villages, Enniskerry. Distance: 18 km / 12 miles. Ascent: 600 m / 1800 ft. Approximate walking time: 5 hours. You are almost done, just 17Km left, and you will have completed part of Ireland’s oldest waymarked walking trail which covers a total distance of 127km / 79 miles. The last section of the Wicklow Way takes you over Prince William’s Seat where you will have stunning views over Dublin City, the Irish Sea and back into the Wicklow Hills. Your trip finishes on a beautiful trail that leads you into Marlay Park. You will spend your last night of the Wicklow Way self-guided walking tour in Dublin. Distance: 17 km / 11 miles. Ascent: 150 m / 450 ft. Approximate walking time: 5 hours.